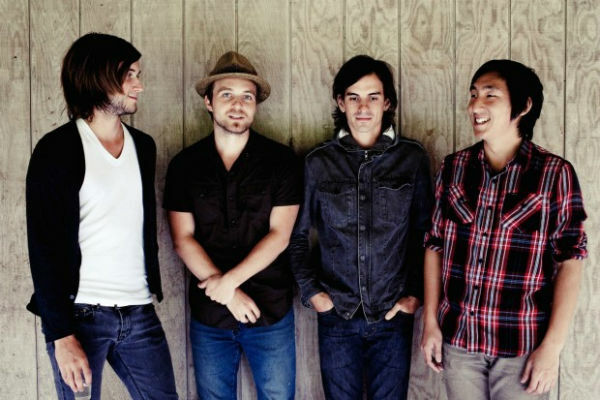 Tim Wilson, Seattle boy and singer/songwriter, formed the folk-pop band, Ivan and Alyosha, with co-founder Ryan Carbary in 2007. The group’s name is derived from two characters from the philosophical Russian novel The Brother’s Karmazov and does justice to their songwriting, which tackles themes of faith and doubt. Joined by Tim’s brother Pete Wilson and Peter Kim, the group is set to release its first full length album, All The Times We Had, in August. Tim Wilson sat down with American Songwriter to talk about the album and shed light on the source of his songwriting inspiration. What has Ivan and Alyosha been working on lately? Well, we got off the road about a month or so ago. We were out on the road with Rosie Thomas. Most of our time home has been basically leading up to the release of this record. We’re trying to put a CD release show together in Seattle, well that’s confirmed actually. We play August 24 at the Neptune Theatre. It’s a Friday night, all ages with a local band named Big Sur. We’re doing press here and there for the release of the record. We’re trying to do a lot of odds and ends, making sure everything is in place for when the record comes out. We just played the Doe Bay Festival announcement party in Seattle a couple nights ago that was pretty great. All The Times We Had is your first full-length album? I noticed “Father’s Be Kind” and “Easy To Love” show up again. Yeah so we chose “Easy to Love” from the first EP to re-record and revisit. Then we chose “Father’s Be Kind,” the title track from the last EP. We chose the stuff that we thought was strongest to rerecord and then we have nine new jams on the album. A lot of those songs we’ve been playing live for a year and a half. There’s some really new stuff that made it on there but a lot of it we’ve been playing live for about a year. I think the title track, “All The Times We Had,” is a really strong. Thank you. Yeah, my brother Pete wrote that song actually. Pete is an amazing writer. We write very differently and I like that. I like when he shows me a song and I’m like, “Oh my gosh I want to sing that song.” It’s always nice to have that kind of songwriting pressure taken off, not to have to write 12 hits. Pete really has added so much on the writing side to the band. Originally the band was only you and Ryan Carbary. How did adding your brother and Tim Kim affect the band? I think it’s just been a natural progression of the band. They were in another band a few years back that broke up and it was kind of a no-brainer on our part. We really needed guys to play live with us. We didn’t want to be some sort of acoustic band or only play tracks or something. Back in the day Ryan and I actually did a show where we played tracks. It was fun but it was kind of dumb, you know? We always wanted a band; it happened naturally. Singing harmonies and things together just came from the relationships that were already there. Writing songs together has been a very natural process. Who is usually involved in the songwriting process for the band? Ryan has definitely written some stuff. He wrote a lot of the song, “Glorify.” It was on the Father’s Be Kind EP. As far as collaboration goes, if I’ve written five songs, and Pete’s written five songs, and Ryan has written some songs, we all come together and play all the songs for everybody. It usually ends up that we gravitate towards the same material. We’ll want to hear certain songs again and so I think that’s when the collaboration starts. It’s rare that we get together, start from scratch and say, “Well alright, let’s write a song.” I know that’s probably coming more in the future but a lot of it is, “Alright, I have this song, it needs more though, where can we take it.” That’s where the collaboration meets. How would you describe this new album? I think first and foremost I’m proud of the songs on the record. I think we continue to develop as a band. I think I continue to develop as a singer and a writer. The most exciting thing to me is that the songs are really great and also the performances are more mature. We accomplished more of what we’ve always wanted to accomplish. I don’t think we made the perfect record but I think we made a good record. But as far as what the record is I think it’s a more accurate picture of who we are as a band, who we are as a live band, where we’ve come from having been on the road for a year and a half. I think that certainly made us stronger as performers and musicians. I think I wrote my first song when I was a freshman in college. I grew up singing. I’d always sung. I’d always loved music but I feel like nobody really told me, “Hey, you should write.” In college I went to a show and I was like “How do you do this? How do you start a band? How do you make music?” I didn’t know. I think the best advice I’ve ever gotten was that it’s all about the song; write good songs and start writing now, because you’re going to write crap songs for 10 years. I think that’s exactly right. I’ve been writing for 12 years now and I finally feel like now I’ve come to a place where maybe I’m comfortable enough with my ability to actually show people these songs and to play them in front of people. Can you explain the songwriting process for “Easy To Love”? Yeah, I wrote “Easy to Love” a long time ago. I was way into Joseph Arthur at the time. “Easy To Love” was this really slow, acoustic, dark, minor key thing. Ryan is and has always been a huge Beatles fan and was listening to a lot of Beatles at the time. He was thinking this “Mother Nature’s Son” vibe, a very stompy and clappy Beatles vibe. And I was like, “Well I don’t know.” So I wrote that song as this darker Joseph Arthur inspired song and he kind of turned it on its head and made it more of an upbeat positive thing and maybe that’s the reason this band is still going. So does that mean you’re Ivan and he’s Alyosha from the Brother’s Karamazov? (laughs) Yeah, to some certain extent possibly. The characters don’t exactly mirror our lives in any way but what’s funny is that there are times where we can embody both characters. Is there a song off the album that you are particularly proud of? I think, “Don’t Want To Die” is one of the better songs I’ve ever written, and one I’m really proud of lyrically. I think it’s an honest song and I don’t really know where that song came from. I’m pretty proud of it. There’s also another song called “The Fold,” that is another song I am particularly proud of lyrically. I think about that song and the lyrics, it’s all third person but it’s very much just about me. As a songwriter what usually inspires you? Red Wine and an afternoon alone… Just kidding. I’ve got a wife and a 2-year-old and I feel like my creativity comes almost as a necessity. I feel like I really have to be alone with myself and my thoughts and insecurities. That’s probably when I write most is when I am most conflicted. Probably the things that I am afraid of most in life inspire me to articulate something in a song or some sort of idea. It’s a way for me to try and make some sort of sense of whatever is around me. Could you say your songwriting comes out of conflict? When you’re approached with adversity that’s where your creativity comes from? Yeah, I’d say so. Maybe that’s why older artists start doing island music, you know? Not that I am saying there is anything wrong with that, but maybe if everything was perfect in my life maybe I wouldn’t write? I feel like I’ve met people who wrote a lot before they met the person they’ve married, and then they say that they don’t write anymore because they don’t have that search anymore. The search isn’t on anymore or the question is answered. But a lot of the material is from the struggle and trying to make sense of it and trying to figure out who you are. I feel like, in life, I write three minute songs because I can’t sometimes articulate what I see or what I want to say in everyday conversation. But I feel like I get to sit down, and I have the opportunity to think about a three and a half minute song for six months until I feel like I’ve got it. So I think that’s the thing I appreciate about songwriting is its brevity, especially pop songs. What’s most difficult for you in the process of songwriting? I think there’s always the fear or feeling that somebody else has got it right and you’ve got it wrong. I know some people don’t have this, but you can fear being misinterpreted, or even if people will like it or not. That’s the thing I struggle most with is wanting to write great songs, and there’s a certain amount of objectivity to that as well, even if it is good. That’s what I struggle with most, and also maybe just the time and the energy to do it. I didn’t write a song the whole time we were on the road, just because it’s such a different state of mind. You’ve got to have time. You’ve got to have some loneliness to write a song. Who influences you as a songwriter? I love the band Delta Spirit, David Bazan a Seattle guy, Harry Nilsson, Brandi Carlile an artist we’ve toured with. She’s a great songwriter. Her guitarist, Tim Hanseroth, is also a great songwriter. Richard Swift, a guy from Oregon, he plays in The Shins now. He’s an insane songwriter. A lot of old stuff too. I don’t really listen to a lot of Beatles stuff anymore, but old Cole Porter and Steven Sondheim. Living or dead, if you could co-write a song with anyone who would you choose? This might be the wrong answer, but I don’t care. I’m a huge fan of Brandon Flowers of The Killers, and I think he writes amazing songs. This is also probably the wrong answer, but I was a huge Michael Jackson fan back in the day. I think his early stuff is insane, there’s nothing that compares to it. Or maybe doing orchestra arrangements for our next record with Quincy Jones, that would be a dream. Could you give us any details about future projects or anything you might be getting involved with? At some point this summer we’re going to go to this cabin we go to every so often when we’re home, and we write and demo songs, and we’ve got a batch of songs for the next record that we want to start working on. Because we know we’ll be on the road quite a bit when the record does come out in August. We’re home most of the summer, but then after the record comes out we’re hitting the road probably off and on to the New Year, and then hopefully looking to record another record before the year is out, if we have the time.